Afilias Australia Pty Ltd announced today that it has set the GUINNESS WORLD RECORDS title for Largest migration of an internet top-level domain in a single transition following its transfer of 3,153,979 .au domain names on Sunday, July 1, 2018. The transfer was made from the systems of a legacy technology provider to Afilias' state of the art registry system in Melbourne, Australia. Internet top-level domain transitions are rare events, as they involve moving all the records for internet addresses ending in, for example, ".au" (i.e. the name, expiration date, registrant, etc.) from the systems of one registry provider to those of another. In addition, the active directory for the names must move. If done improperly, names may stop working, which could be disastrous. auDA, the domain authority for all addresses ending in ".au," hosted an RFP process in 2017 to advance the goals set by the .au Registry Transformation Project; this process led to the selection of Afilias to replace the legacy provider. Planning began in December, and the transition itself was completed on July 1, 2018. .au is one of the largest country code domains in the world (over 3M names), but Afilias, the global leader in secure transitions, was able to complete this move without interrupting service to any names. GUINNESS WORLD RECORDS Adjudicator Hannah Ortman presented Afilias Australia Pty Ltd with their GUINNESS WORLD RECORDS certificate during an event today in New York City. Attendees included: from Afilias, Ram Mohan, Executive Vice President and Chief Technology Officer, and Roland LaPlante, Senior Vice President and Chief Marketing Officer; from auDA, Cameron Boardman, Chief Executive Officer, and Alister Paterson, Head of Government Affairs, Strategic Advisor; and from GUINNESS WORLD RECORDS Hannah Ortman, Head of North America Records Management Team, Peter Harper, SVP Americas, and Alex Angert, Senior Account Manager. "Afilias is proud to receive the GUINNESS WORLD RECORDS title for the Largest Migration of an Internet Top-Level Domain in a Single Transition," said Ram Mohan, EVP and CTO of Afilias. He added: "We have transitioned and upgraded many top-level domains but are especially proud of the .au project due to its size and complexity. .au can now enter a new era of growth and vitality enabled by modern, high capacity, secure, resilient and Australian-based infrastructure. We look forward to supporting the entire Australian internet community for many years to come." Cameron Boardman, CEO of auDA said: "The transition to Afilias' modern registry positions .au to provide all Australians the best possible service by ensuring the reliability and security of operations as well as the confidentiality, integrity and availability of data." 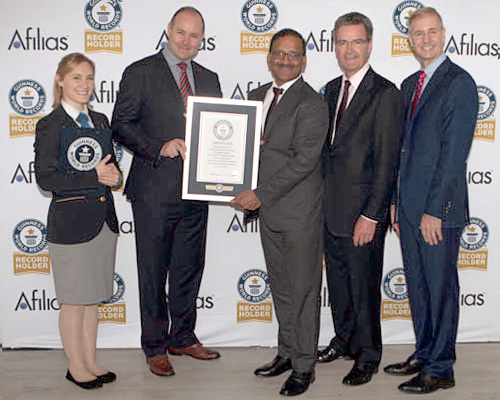 GUINNESS WORLD RECORDS Adjudicator, Hannah Ortman, said "It is an honor to present Afilias Australia Pty Ltd a certificate for achieving a GUINNESS WORLD RECORDS title. I am thrilled to announce they are now Officially Amazing™!" Local Time: Friday, April 19, 2019 03:41 AM PDT – Page Load: 0.4161 Sec.